Update: I’m so inspired by your comments! Your comment may take a few hours to show because they go into a moderation queue. I’m giving away a copy of the new Delicate Crochet book by Sharon Silverman to a randomly chosen commenter on this post. You’re welcome to enter even if you live outside of the USA. If you win and you have a non-USA shipping address, you’ll receive a free downloadable crochet pattern of your choice instead. Scroll down for the book giveaway details. Over the holidays I “riffed” on the patterns I wrote for Delicate Crochet. I’ll explain how, in case you have (OR WIN!!) this book and want to riff too. Zegue (left) with Delicate Crochet’s Ziggy Vest on the right. Yarn: I had one small ball each of the four Stacy Charles Fine fashion yarns I used. (See Zegue’s project page in Ravelry for the yarn facts.) One of them has sequins so I had to use it. Using a mix of yarns for the Ziggy stitch pattern was really fun! I’ve always wanted to do a stripy scrappy ripple, especially in Tunisian stitches. Crochet Hook: I used the 7.0 mm Addi Tunisian crochet hook from my shop; the Ziggy Vest calls for a 6.0 mm size. A 6.5 mm for Zegue would probably be just as lacy though you might need a few more rows and additional stitch repeat or two. Finished Dimensions: 14″ x 57″ (35.6 x 144.8 cm), measured flat and blocked. I like wearing it as a wrap. For a shrug option I might add buttons. It weighs 71 g. and I had about a quarter of the Luna mohair and Crystal left over. I chose the length of each row to match the length from my wrist over the shoulders and across the back to the other wrist while my arms hang at my sides—an easy measurement (57″/144.8 cm). This is because I thought I was going to turn it into a shrug. I just kept adding rows until my forearm would fit through the sleeve tube if I seamed part of the first and last row together; I’d need a minimum of about 9″ (22.9 cm). I figured the yarn amount would get me at least this far. I chained 178 with Color A (Stella). Row 1 forward pass (FP) is also Stella, and then I changed to Color B (Luna) for the return pass (RP) and the Row 2 FP. Fasten off every time you change yarns. Row 2 RP and Row 3 FP: Change to Color C (Céline). Row 3 RP and Row 4 FP: Change to Color B (Luna). Row 4 RP and Row 5 FP: Change to Colors C+D (Céline & Crystal held together). Repeat the color sequence of B, C, B, C+D for a total of 16 rows; for Row 16 RP change to Stella. Complete Row 17 FP and RP with Stella and then fasten off. 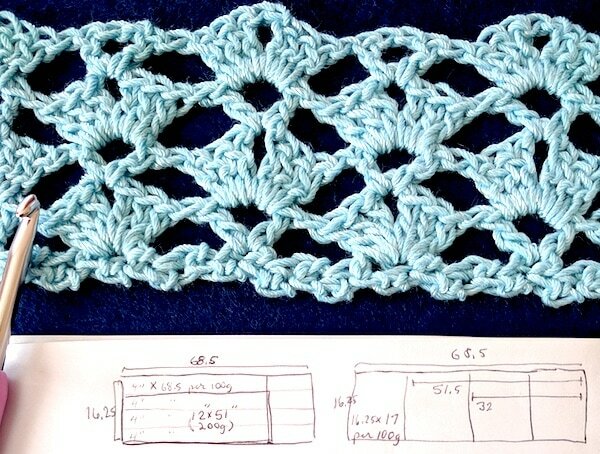 Edge Row 17 with a strand of Luna and Crystal held together: Single crochet (sc) in first FP stitch, chain 1, slip stitch (ss) in same sc, sc in same stitch, *chain (ch) 1, sc in next FP stitch, ch 1, sc in next stitch group, ch 1, sc in next FP stitch, [sc, ch 1, ss in same sc, sc] in next FP stitch, repeat from * in each remaining FP stitch of row. Fasten off. Attach Stella to first foundation ch. Working along the other side of the foundation, sc in first ch, ch 1 and skip next ch that was not used by a FP stitch, sc in available loop of next used foundation ch, repeat from * in each remaining stitch of row. Fasten off. Attach Luna and Crystal to first sc of Stella. Edge this row the same way you edged Row 17. Yvelino Ring (left) with Delicate Crochet‘s Yveline Wrap on the right. For this version of the Yveline Wrap I used four colors of lace weight Icelandic wool, one ball per color. See its project page for the yarn deets. I loved this yarn; it’s very “sticky” and almost bristly or wiry in a way that works great with this airy bias-worked net. Crochet Hooks: 5.0 mm (H) Tunisian hook; for the surface-crochet I used a regular 3.5 mm (E) crochet hook. Finished Dimensions: 13″ wide with a 58″ circumference (33 x 147.3 cm). It weighs 100 g. so I used only half of each ball. (I thought I might want to add a lot of surface crochet, so I reserved yarn for that.) Instead, I like the texture contrast zones. Chain 58 in Color A. Complete 33 rows. Edge the last row with sc. Slip stitch Color B to the bottom right corner foundation chain of the previous panel. Chain 58. At the end of the Row 1 FP, slip stitch in the first FP stitch of Row 1 of the previous panel and then complete the RP as usual. Repeat this join-as-you-go process at the end of every FP until you’ve completed 33 rows. Edge it with sc like the previous panel. Adding the Frills: The only thing different from the book is that I used a 3.5 mm (E) crochet hook, and surface crocheted a column on each side of the joins. I hold onto lots of crochet pattern books and “mine” them for interesting stitch patterns (love those stitch symbols! ), shapes (love those schematics! ), and construction methods (love the rare assembly diagram!). The stitch texture combinations, color contrasts, or styling ideas in pattern books are also inspiring. 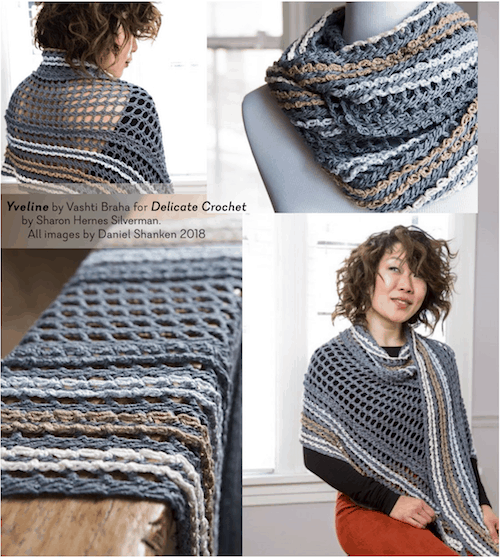 Delicate Crochet offers hours and hours of riffing on its interesting stitch patterns, shapes, and styles, thanks to the range of designers represented—and thanks to all the stitch diagrams and schematics. You could win this! Delicate Crochet by Sharon Silverman with 23 patterns by 10 designers. I’ll use a random number generator no earlier than February 18 (Monday, President’s Day) to choose from among the commenters to this post. There may be two winners: one with a shipping address outside of the USA as well as within it. If the first winner has a non-USA shipping address, the prize will be a free downloadable crochet pattern (winner’s choice). I will then draw a new number randomly until the new winner has a USA address to which I can ship the book. To contact the winner(s) I will do these three things: comment on your comment with the news, and announce the winner’s name (as it appears on your comment) in my Ravelry group, and at my Facebook page. I suggest you opt-in to receive alerts of responses to your comment in case you’re a winner. Your comment may respond to my question, “What crochet book would you like me to write?” (as explained in my newsletter #97), or at least be crochet-related. I reserve the right to remove spammy comments as always. Commenting more than once does not improve your chance of winning.